We want to make sure that your experience with us on our Tamil Matrimonial site will be pleasurable and memorable since we have the workforce with the combination of skills and dedicated for service. In our Tamil Matrimonial site the payment options for customers is easily accessible and we offer various payment modes for the convenience of the customer like Credit card, Debit card, Net banking, Cash payments, Mobile payments and free door step collection. We have a range of add on packages like profile highlighter, Matrimony booster, Homepage profile, Caste feature profile, homepage feature profile to reach our customer’s profiles with their matches. We have a very special facility of subhamuhurtham where you can check mukurtham dates for any month of the current year. We don’t accept any cash acknowledgement from the customers if their marriage fix through us. Since we remove married and engaged profiles immediately the married profiles ratio in our Tamil marriage site is very low. 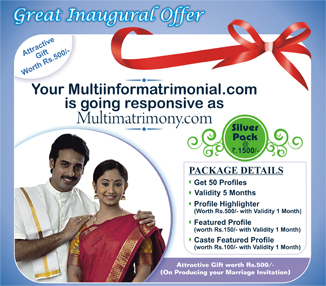 We have a very innovative package named Life Partner which can be available with a nominal cost of Rs.5000/-.